Some ThunderCats, in preparation to, err, ho. The internet, as it is wont to do, got into a bit of a hissy fit recently with the announcement of ThunderCats Roar, a comedy-tinged, heavily stylized re-imagining of Lion-O and his friends that had some fans wishing the franchise could’ve gotten a more serious reboot instead. But Thundercats already did, seven years ago, and it was pretty good! However, it was short-lived. The 2011 ThunderCats series died a sad death after just 26 episodes, brought down (like several other Cartoon Network endeavors) by poor toy sales. But Thundercats’ legacy and anime-esque style would live on beyond its short run: what it did for the classic 1985 series can be seen in the DNA of beloved shows like Legend of Korra or the Voltron reboot, shows that went on to have long, successful runs and come to represent a new age for adventure cartoons that balanced all-ages fun with darker storylines and intriguing character development. Lion-O and Tygra’s sibling rivalry dominated the first half of ThunderCat’s story. 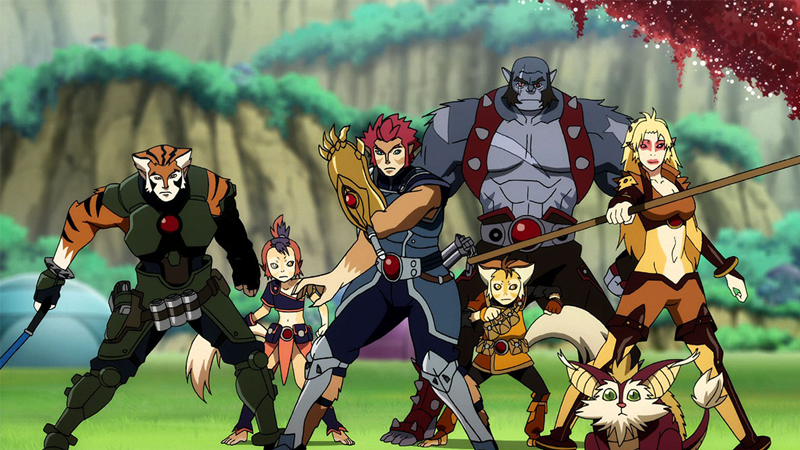 A complete tonal and stylistic reboot compared to the camp scifi fun of the original show, the 2011 ThunderCats series played out more like a grand fantasy. It revolved around the titular feline team being reframed less as refugees on a strange new world as they were in the original show, but instead as the leaders of a ragged band of Thunderians fleeing from their kingdom as its invaded and pillaged by the villainous forces of Mumm-Ra. Young and inexperienced, the Lion-O of the reboot was beset by both his own personal doubts and insecurities as he was thrust into a position of leadership he never expected to have, but conflict from within the ThunderCats themselves—especially his adoptive brother Tygra, who was jealous of Lion-O’s birthright to the Thunderian crown and competed with him for the affection of their teammate, Cheetara. Even Mumm-Ra felt like a compelling threat instead of an ineffective repeat villain, a worthy foil for Lion-O as he grappled with the desperate situation the Cats find themselves thrust into. It was character drama like this where ThunderCats really shone, balancing the traditional action fare of the team’s quest to retrieve the Book of Omens (and eventually a trio of magic stones to prevent Mumm-Ra from ascending to godlike power), with Lion-O’s growth into his role as not just the lord of the ThunderCats, but the king of his beleaguered people, navigating a sea of tumultuous relationships and even some pretty shocking betrayals. Lion-O had to learn statecraft and diplomacy, and overcome his own personal grief over the loss of his father and his home by uniting the disparate kingdoms of the Third Earth to fight against Mumm-Ra’s tyranny. It was a journey that touched on everything from xenophobia to Thundera’s own anti-technology beliefs. The introduction of fan-favorite Pumyra in the second half of season 1 lead to some really unexpected twists with the character. To be fair, the show could drag, admittedly—it tried to strike a balance between focusing on Lion-O’s journey and more lighthearted adventures for the team (especially WilyKit and WilyKat, who benefit from being marginally less excruciatingly annoying in the reboot), but those sillier episodes weren’t nearly as compelling as the show’s world-building or the fight against Mumm-Ra. And the first half saw a lot of the good character drama among the team waylaid by love-triangle shenanigans between Lion-O, Tygra, and Cheetara. Ironically, given the reaction to ThunderCats Roar recently, at times it almost took itself a bit too seriously, which made the moments of levity feel even more out of place. But looking back at it now, it’s hard not to see the promise cut short by the show’s sudden cancelation, especially given that it ended with some pretty big cliffhangers. More significantly, the show’s nuanced take on these beloved characters had a lot of potential still to explore. In a time where classic franchises of the ‘80s are almost constantly being updated and rebooted for modern audiences, if it had been made just a few years later, the 2011 ThunderCats probably would’ve lasted a bit longer. Instead, we can wonder what could’ve been—and wait to see how Roar will adapt Lion-O and his friends yet again. Weird New ThunderCats Cartoon, Ho!